Summer signing Craig Davies got off the mark for Mansfield Town in Saturday’s 2-2 draw at Yeovil. Davies’ strike was something of a gift as Alefe Santos’ blocked clearance fell kindly to the striker, who had time and space to find the bottom corner for his ninth minute equaliser. Davies, signed from Oldham Athletic, said: “It is always nice to score and I was happy to get off the mark. 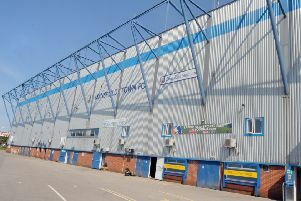 Davies might have had more goals in the second half as the Stags twice came from behind in their first away match of the League Two season. “The keeper pulled off one good save and I was disappointed with a header that went (was cleared) on to the bar. I am disappointed but I was happy to get the chances. As long as I keep on getting them I will be happy. Davies admitted Yeovil started well, but said the Stags created the better and more chances to win the game. The striker was one of five new faces to start the match after manager David Flicroft reshaped his squad over the summer. “We have done well together. It doesn’t feel like a new group gelling. It feels like we have been together for quite a while,” said Davies. Talking about his new strike partner, Nottingham Forest loanee Tyler Walker, Davies added: “Tyler is a very god player. He has played quite few games at Nottingham Forest and you don’t do that as a young player unless you have got something about you. “He has got really good movement and he is a good finisher. “Hopefully I can help him go back to Forest a better player.